This objective is all to do with continuing to develop the great CQ lifestyle experience for visitors and people working in the area to enjoy. As well as tackling ASB and crime issues, the Cathedral Quarter Rangers continue to work on helping to promote the area, liaising with visitors on a daily basis, providing support for businesses and highlighting the benefits and opportunities which exist through BID projects and initiatives. The Rangers wear a uniform in the distinctive colours of the Cathedral Quarter BID and carry body worn video cameras. Over the course of the last twelve months Jon and Scott have amassed over 3,400 hours patrolling the streets of the Cathedral Quarter dealing with everything from major first aid incidents and evacuations to supporting events and rescuing injured animals! 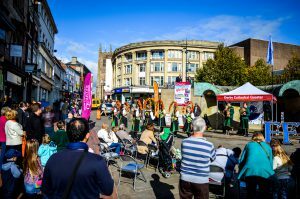 The Cathedral Quarter funds a summer outdoor entertainment programme on the Market Place consisting of two monthly events – CQ Saturdays Street Circus and CQ Saturdays Knickerbocker Glorious. CQ Saturdays Street Circus takes place on the second Saturday of each month between May and September. A ‘taster’ event for Derby Festé, CQ Saturdays Street Circus consists of a variety of street circus and theatre acts and is produced by Déda. CQ Saturdays Knickerbocker Glorious event takes place on the third Saturday of every month. Organised by Furthest from the Sea, this year’s program centres around themed weekends and includes an eclectic mix of music, dance, theatre, poetry and comedy – featuring some of the best local and regional talent. Click here for more information on events in the Cathedral Quarter. The Cathedral Quarter BID have joined together with Arriva to offer employees of Cathedral Quarter businesses some great value offers on local Arriva Midlands bus travel. The scheme allows users to travel by purchasing a yearly ticket but paying for it monthly with a direct debit and includes significant savings over the normal cost of travel. Tickets also allow for free child travel (for up to 2 children) at weekends and on bank holidays when travelling with a Club-Members Travel Club season ticket holder. Click here for more information. Christmas is an incredibly important time for businesses in the Cathedral Quarter and as such the BID is heavily involved in activities and promotions during this period. The BID works alongside Derby City Council to ensure that the Cathedral Quarter has a comprehensive festive lighting display with cross-street and lamppost illuminations, floodlighting and tree wrapping in locations around the area. 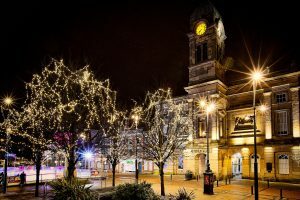 The BID also funds and organises a range of Christmas entertainment including the CQ Saturdays Knickerbocker Glorious events and the Cathedral Quarter 3aaa Christmas Ice Rink which regularly attracts over 15,000 visitors each year. The Cathedral Quarter BID plays an integral role in ensuring that Derby retains its Purple Flag Accreditation, working with partner organisations and businesses to ensure the effective management of the night time economy. For more information on Purple Flag, please click here. 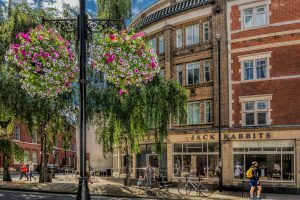 The Cathedral Quarter BID funds the installation and maintenance of hanging baskets in the area to create a brighter and increasingly pleasant environment for workers and visitors alike. This years sees an extended program implemented on existing infrastructure with baskets installed on Queen Street, Cathedral Road, Iron Gate, Market Place, St James Street and Corn Market. 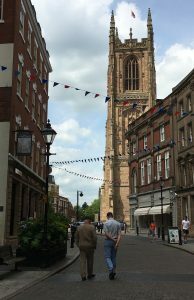 The Cathedral Quarter BID funds the installation of bunting on Corn Market, Iron Gate, Sadler Gate and The Strand to create a festival atmosphere in the area. The bunting is in place between May and October.